Looking for some Free Printable Preschool Alphabet Worksheets? Then look no further! I’ve got ya’ covered! I’ve scanned the entire internet world for the best free alphabet worksheets and compiled them all here for you! Remember that when teaching your little ones the alphabet, repetition is essential. Sing songs, play games, work on these printable, and your little one will have their alphabet memorized in no time! In addition to doing these free printable preschool alphabet worksheets, be sure that you also throw in some phonics along the way. Teaching the sounds of the letters as they learn their ABC’s will help later on when you start teaching them how to read. Okay let’s get to these awesome freebies shall we? *Free A-Z worksheets: This is great for the introduction of the ABC’s. 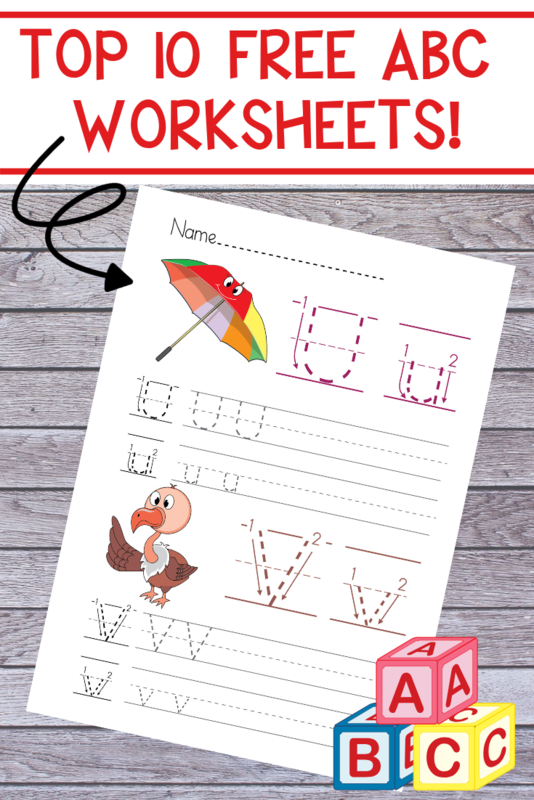 Each worksheets has the letter plus several pictures of things that begin with that letter. These also make great coloring sheets! *ABC Workbook: This packet includes 26 fun pages covering each letter of the alphabet. Kids will get to color the given letter, select objects that start with that letter, learn how to write the letter, and also do some fun letter finds. *ABC Flashcards: Cute flashcards that are great for reviewing the ABC’s. *Fun ABC Dot Marker Letter Find: This is great for practicing letter recognition. *Picture ACB letter find: This is a fun pack for practicing letter recognition. The ABC’s are hidden in everyday pictures. Can you find them all? *Alphabet puzzles: Fun puzzles where little ones match up the beginning sounds of words to the correct pictures. *Alphabet coloring pages: Let your little ones practice their fine motor skills while coloring these fun ABC coloring pages! *Alphabet bracelet craft: Have your kiddo’s cut, color, and paste together these cute alphabet bracelets. *Color by letter: These fun color by letter worksheets will help your children search and find the correct letters and help improve fine motor skills as they try to color just the correct spaces! *Writing practice: Looking to practice writing letters? These alphabet worksheets will help your children practice writing both capital and lowercase letters. I have tried several times to print something from your sight and it just reroutes me to another dead end. It shouldn’t be re-routing you at all. It will automatically open a new window with the PDF. Maybe try another browser or if you are on a mobile device please try from your computer.